Volunteer support is greatly appreciated at these centers within and around Huaraz to help teach English, improve conversational skills and share information about different countries and cultures. It is possible for you to work as many hours as you like within numerous centers and really benefit from your volunteering experience. Although useful and certainly welcomed, a TEFL (Teach English as a Foreign Language) qualification isn’t necessary to enjoy your volunteering placement. 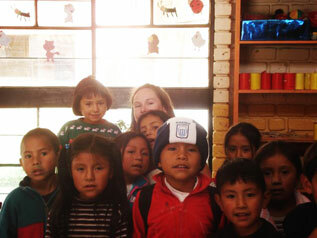 At Teach Huaraz Peru we strongly believe that everybody can make a difference and help those who want to learn. Teaching English is a fun but challenging activity and it is important to prepare adequately. There are plenty of TEFL websites that offer valuable suggestions for games, activities and lesson plans for all ages and levels, as well as numerous books which can be purchased before departure or borrowed for free from your local library (see the Resources page). Don’t be concerned if you have no teaching experience and feel daunted by the prospect of standing in front of a class of thirty eager students. This is perfectly normal and you will soon find yourself gaining confidence and enjoying the experience immensely. When you commence teaching you will work alongside a Peruvian teacher who will make you feel at ease and help you in becoming familiar with your students. As you become more comfortable the teacher will give you more responsibility and, if interested, will provide the opportunity to lead classes. There is also8 the possibility for qualified English teachers to make a little money at the Language Center. With a professional approach and desire to help you can really make a difference and give something of great value to the Huaraz community. Learn more about who can volunteer. 8:00 A breakfast of fruit salad, eggs, olives, tea, and coffee is served. 8:30-12:00 Morning at leisure. Common activities include visiting local hot springs, going running up into the hills that lie behind the house, and exploring the local market. One volunteer spent many mornings exchanging free private English lessons for free private dancing lessons (Cumbia, Salsa, Huayno, Reggaeton, etc.) Additionally, there are several cafes where it is possible to meet and interact with other foreigners, such as Cafe Andino and California Cafe. 12:50-6:00 You will be assisting a local public high school teacher in their English classes. Generally, volunteers will help students and teacher with pronunciation and grammar. Additionally, if volunteers desire, there are always opportunities to teach classes themselves. 6:00-8:00 At leisure. If you want, this is also a great time to take some Spanish classes from Luis Delgado. Completely at leisure. Common activities including hiking and trekking in the Andes to locales such as Laguna 69, Laguna Churup, Pastoruri Glacier, and many more. Many volunteers are also invited to spend the weekends with other families, as well as to local events such as Prom, birthdays, dance festivals, quinceañeros, and more. Some volunteers have also gone on overnight trips with locals to other cities. We are also currently seeking licensed and trained psychologists, as well as experts to aid in the development of a series of weekend getaways for troubled children in the area coming from schools. We believe that with the right staff nature can become a safe haven for the children. The weekends would include two to three nights camping in the surrounding areas and the development of a series of training sessions to teach children how to constructively respond to certain situations.